These days, it seems everyone knows (or is) a foodie, a self-proclaimed guru of all things edible. To add to the myriad of “foodie gift guides” shopping sites have created this month, the USDA Meat and Poultry Hotline has put together a list of inexpensive kitchen essentials, most of which are small enough to fit inside a stocking or gourmet gift basket. The best part: these gadgets ensure the giftee will return the gesture with perfectly and safely roasted (or braised, smoked, flambéed…) treats this holiday season and year-round. Food Thermometer(s). There is a food thermometer to fit every budget, preferred cooking method, and technological aptitude, and every foodie should have at least one. A food thermometer is the only implement that can tell if food is cooked to a safe temperature to destroy illness-causing bacteria, which is a guest your holiday gathering can certainly do without. Thermometers can be purchased at the grocery, the hardware store or specialty cooking stores; this Kitchen Thermometers fact sheet can help you choose the right one. A Timer. Time and temperature are a dynamic duo when it comes to controlling bacteria for safe and successful meals. Besides letting the chef know when to check for doneness with their new food thermometer, a kitchen timer or a watch also can keep track of how long perishables have been left at room temperature. Bacteria grow fast between 40˚F and 140˚F (known as the “Danger Zone”), and perishable items should be refrigerated, reheated or thrown out within two hours of being held in this temperature range. Do you know How Temperatures Affect Food? Cutting Boards. These might not fit into a stocking unless they’re the flexible kind, but colorful cutting boards can be practical and spice up the kitchen decor. To avoid cross-contamination, we recommend using one cutting board for preparing raw meat, poultry and seafood, and a separate board for chopping salad ingredients or other ready-to-eat food. Using cutting boards in different colors can help chefs remember which board goes with each item. Read more: Cutting Boards and Food Safety. Appliance thermometers. Oven, refrigerator and freezer settings may vary, and age can take its toll on their heating and cooling components. Appliance thermometers will indicate whether the oven is heating at the proper temperature, and if the refrigerator and freezer are maintaining safe temperatures at or below 40˚F and 0˚F, respectively. This is crucial for getting the most out of holiday leftovers! Freebies! 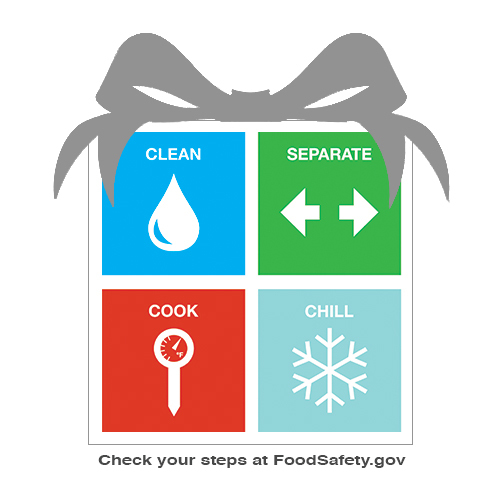 The USDA Meat and Poultry Hotline and USA.gov have partnered to offer a “Safe Cooking Tips for the Holidays” collection of publications that you can order online through Jan. 2, 2013. If your gift swap is too soon for the publications to arrive by mail, they’re also available as PDF’s to download and print. The English and Spanish-speaking experts at the USDA Meat and Poultry Hotline (1-888-MPHotline or 1-888-674-6854) are available weekdays from 10 a.m. to 4 p.m. ET to help with holiday food safety questions. USDA’s virtual food safety expert, Ask Karen, is available 24/7 at AskKaren.gov or m.AskKaren.gov on your smartphone. The app is also available from the iTunes and Android app stores.